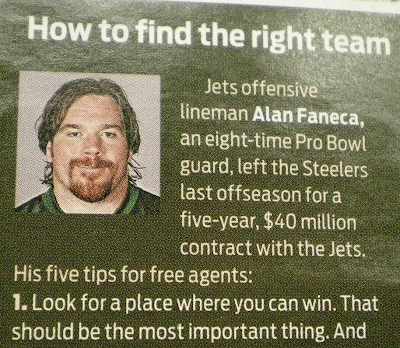 Apparently this appeared in the latest issue of The Sporting News. Try and contain your laughter. That's right, look for a place you can win. It's the most important thing. You know, like ditching a perennial contender for a 4-12 team that for some reason thought they were a veteran or five away from a Super Bowl appearance in 2008. And did I mention that team plays in the same division as New England? That's a recipe for a winner if I've ever seen one. And by the way, if any of you prospective free agents see a lowly Steeler lineman on the street, ask him what their 2008 championship rings are going to look like.